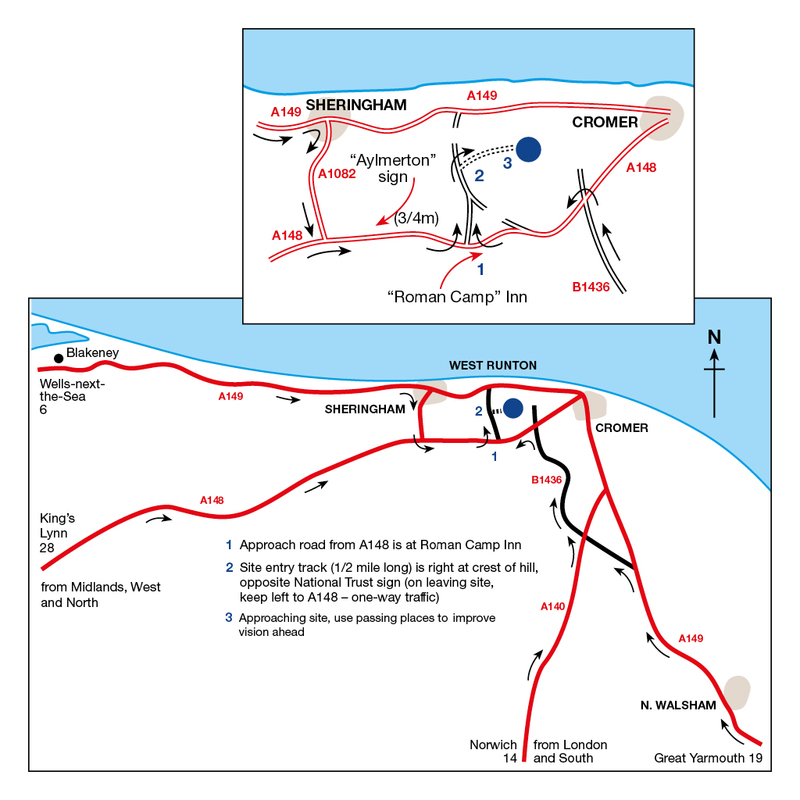 Enjoy coast and countryside from this popular north Norfolk site near Cromer. You can get a feel for the beautiful and varied Norfolk coast and countryside from our Club campsite at West Runton. Our pretty and spacious campsite commands a secluded location close to the quaint seaside village with which it shares its name. Trees surround this beautifully maintained site. Facilities include roomy showers, a parent and child room, laundry and washing up area and a lovely dog walk. Just a short walk from the campsite brings you to the quaint fishing village of West Runton. Its sandy beach is perfect for sunbathing while the plentiful rock pools are waiting to be explored. For more sandy beaches, piers and promenades Sheringham, Cromer (both within walking distance of the campsite) and Caister-on-Sea tick the boxes. A mile south of West Runton, Beacon Hill is the highest point in Norfolk. Scale the dizzy height of 300ft, and you’ll be rewarded with views over the countryside and coast. For nature lovers, Blakeney Point is a must. This mix of dune, marsh and shingle is home to seals and a variety of birds. Catch a ferry from Mortson Quay to see them. There are more animals to be seen at the Hillside Shire Horse Sanctuary and the Norfolk Shire Horse Centre close to the campsite. Difficult access via lane through woods with passing places. Many pitches are sloping and chocks will be required. Two boules courts are available. West Runton Beach is approx 1 mile from the campsite. The site shop sells local fresh local produce, Sheringham Market takes place on Wednesdays and Saturdays. Cookies Crab Shop in Salthouse & Rocky Bottom at East Runton serve local fish, crab and lobster. Roman Camp Hotel serves afternoon tea. One of East Anglia’s most elegant country houses, Fellbrigg Hall is a 17th century estate, noted for its Jacobean architectural elements and Georgian interior design. Explore over 520 acres of woodland, verdant parkland and glistening lake. Situated beside the north Norfolk coast, Holkham Hall is a luxurious 17th century country house with a pristine 6 acre walled garden. The hall exhibits elements of Palladian style architecture and displays a diverse collection of art including paintings by Rubens, Van Dyck and Gainsborough. Sandringham Club campsite is in a delightfully secluded spot, within the grounds of the Royal Estate in Norfolk.